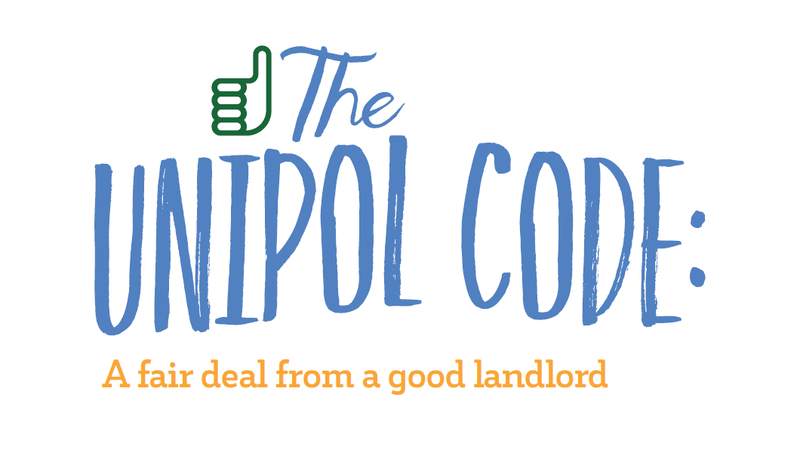 If you live in Leeds you may hear the ‘Unipol Code’ being mentioned when you’re searching for student homes. Leeds’s institutions recommend living in a Code property, and here is a summary of the reasons why. In a nutshell, it’s a voluntary accreditation scheme run by Unipol. Landlords who sign up to the scheme guarantee a high standard of property, customer care and health and safety, which is above legal requirements. These properties are regularly inspected to ensure these standards are being met, and any issues can be raised to see a quick improvement. Look out for the green thumbs up! Priority 1: within 24 hours, where there is a danger to tenant health and safety or security or risk of serious damage to the property. Priority 2: within 5 working days, urgent repairs which effect comfort or convenience. Priority 3: within 28 days, non-urgent repairs that don’t fall into the above categories. If you want to ensure you’re living in a good quality house which is safe and secure and has a landlord that will deal with any queries or complaints within set timescales, then make sure to rent a Code property. Because of the tough entry criteria and it being a voluntary accreditation scheme, landlords who sign up to The Code are doing so because they want to maintain their high-quality student housing. If you want to find out more about The Code and how it works you can visit our website, or you can read the full version of the new Unipol Code booklet here. Registered in England and Wales No. 3401440. Registered Charity No. 1063492 VAT Registration No. 698 8456 49. Unipol is a Registered Trademark.